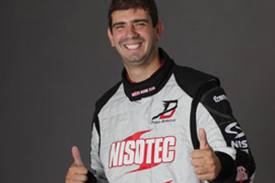 Campos will run a second 2014-specification Chevrolet for Dusan Borkovic in next year's World Touring Car Championship. The Serbian had originally been earmarked to drive a SEAT in the TC2 class for the team, but this entry will now have a different driver. Instead Borkovic will join the already-confirmed Hugo Valente in a two-car Chevrolet line-up for Campos. "I've got the chance to perform with one of the strongest names in motorsport," said Borkovic, who is graduating from the European Touring Car Cup's S2000 class. "Given that I needed to quickly respond to the offer, I didn't have to think too much and I agreed to be part of the WTCC's elite class." Borkovic's deal means that four of the six Chevrolets that RML is building for 2014 are now spoken for, with ROAL running a pair for Tom Chilton and Tom Coronel.